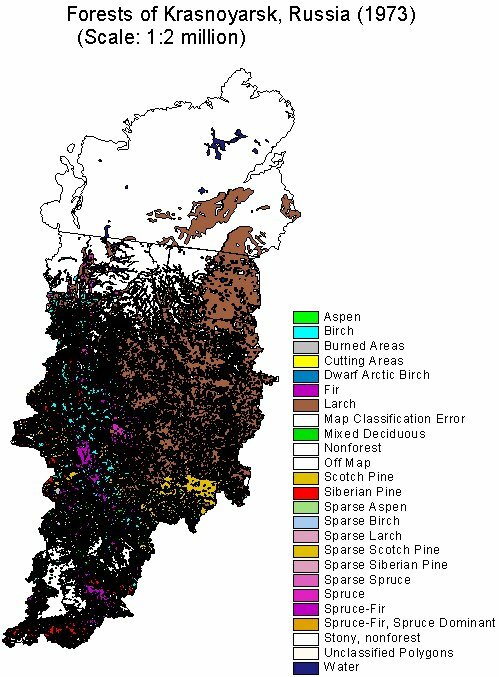 This data set consists of a 1:2 million scale forest cover map for the land area of the Krasnoyarsk Region, Russia. Thirty-two land cover classes are distinguished. These data were digitized from maps of the Atlas of Forests of the USSR (Anon. 1973). This map should be viewed not as a map of actual forest cover but rather as a map of dominant tree species. Very few tree species are defined, and generally, each polygon and color has only one tree species assigned to it. Unlike other data sets associated with this project, this data set is available only in ArcView shapefile format (vector). A graphic map is also available in JPEG format (see Figure 1). Please read all documentation before using these files. Stone, T. A., P. Schlesinger, and V. A. Alexeyev. 2003. RLC Forest Cover of the Krasnoyarsk Region, Russia, 1973. Data set. Available on-line [http://www.daac.ornl.gov] from Oak Ridge National Laboratory Distributed Active Archive Center, Oak Ridge, Tennessee, U.S.A. doi:10.3334/ORNLDAAC/693. This data set consists of a 1:2 million scale land cover map for the land area of the Krasnoyarsk Region, Russia. Please read all companion documentation before using these files: http://daac.ornl.gov/daacdata/russian_land_cover/forest_map_krasnoyarsk/comp/fmap73_kr_readme.txt and http://daac.ornl.gov/daacdata/russian_land_cover/forest_map_krasnoyarsk/comp/fmap73_kr_projection.txt. Vector map of forest polygons in the Krasnoyarsk Region (1973). Data are in ArcView shapefile format (compressed). This data set was derived from six source map sheets. Each sheet size is slightly different from the others because each is on a different page in the Atlas of Forests of the USSR (1973). All of the polygons on the map sheets were digitized, edited, and labeled using the Rootspro(c) Digitizing System. Each map sheet was imported into ArcInfo for UNIX, where it was transformed to real world coordinates using Digital Chart of the World (DCW) and World Vector Shoreline (WVS) vectors for control. Each of the map sheet coverages was reprojected from Equi-Distant Conic projection to Lambert Azimuthal Equal Area projection using ArcInfo's PROJECT command and the parameters below (See Processing Changes). Accurate mosaiking of the map sheets within ArcInfo proved to be less than satisfactory. None of the map sheets had embedded real world coordinates, and fifty control points were used in each case. The subsequent vector coverages was converted into ArcView shapefile format. This map should not be viewed as a map of actual forest cover. It should be viewed as as a map of dominant tree species. Very few tree species are defined, and generally, each polygon and color has only one tree species assigned to it. As in other maps, the polygons are discreet entities, tree species categories do not blend into one another. In nature, vegetation types and forms tend to go through gradual transitions from one group of plant species to another. This gradual transition is lost in cartographic products when a line is drawn that separates two units of land cover. Maps that are produced from satellite data are generally raster products that do not define well-bounded polygons and, in a sense, may be more representative of nature. These data were digitized from maps of the Atlas of Forests of the USSR (1973).